This case study was developed through a conversation with Jennie Mackeith, Children’s Joint Commissioner and Sarah Brown, Strategic Commissioning Manager, at London Borough of Camden and Camden Clinical Commissioning Group, and a review of the Minding the Gap Evaluation report (Camden and Islington Public Health, 2018). 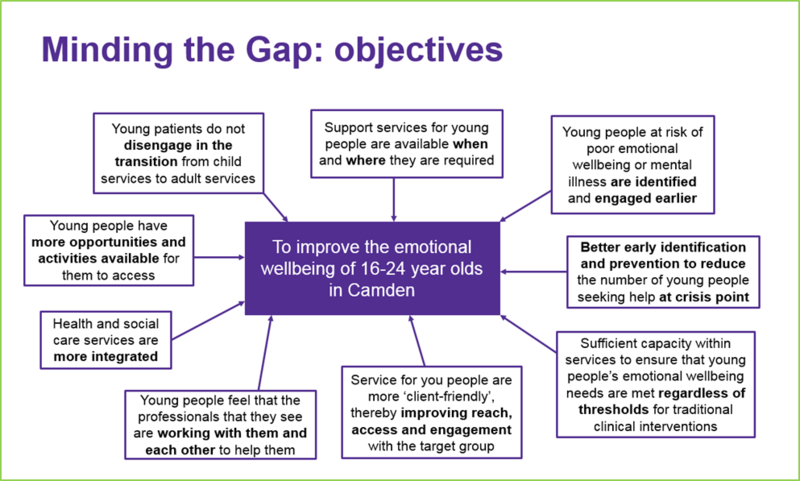 The Minding the Gap service was commissioned in response to a strategic review of community Child and Adolescent Mental Health Services (CAMHS), feedback on poor integration of mental health services working with vulnerable young adults and delays in accessing support from appropriate services to meet the needs of young people in Camden who were making the transition from children’s services to adult services. The aim of Minding the Gap therefore, was to ensure vulnerable young people had rapid access to support to reduce crisis presentations, support a smooth transition to adult services, and improve access to services, experience of care and clinical outcomes. A consortium of providers led by the Brandon Centre, Catch 22 and Camden and Islington NHS Foundation Trust (CIFT) were contracted to deliver this service from April 2015 to March 2018, with the Tavistock and Portman NHS Foundation Trust, Anna Freud National Centre for Children and Families, and The Winch youth centre forming part of a wider network of stakeholders. Camden Minding the Gap Transition Meetings occur fortnightly and provide a forum for multi-agency discussion, agreement and planning for any young person who is transitioning from CAMHS to Adult Mental Health Services (AMHS) and for cases already in adult services where there is a concern about disengagement and risk to be reviewed. Senior clinicians support referrers around developing an effective management plan for young people to enable seamless transition and to monitor the effectiveness of this. The meeting is a highly valued forum where specialist input is given around challenging cases. Input is provided by the Tavistock and Portman NHS Foundation Trust, Camden and Islington NHS Foundation Trust, Brandon Centre, University College London Psychological Services, Substance Misuse Services, Early Intervention Service, Looked After Children Service, Young Persons Hostel Pathway and other stakeholders with an interest are invited to attend as identified. Young person (YP) was signposted from CAMHS to The Hive during a time of crisis and high emotional distress. YP is male and needed to transition from CAMHS to Adult Mental Health as he is 19 years old. As well as his mental health needs he required support with many psychosocial and practical issues that were contributing to his mental health difficulties: he suffers from anxiety and depression and has multiple complex, chronic physical health issues. Due to the level of risk one of the Team Lead’s is YP’s worker. YP moved to London three years ago with his family and he currently lives with his mother, younger brother and his step dad. He has had CAMHS involvement for many years due to his anxiety and low mood. There had been Social Services involvement due to a serious incident of domestic violence between his step dad and his mother, in which YP intervened to stop his step dad from strangling his mother. He has a complicated relationship with his mother and they are verbally abusive towards one another and there is a high level of conflict. Due to his high level of need and the anxiety the family provokes in the network, there are many different professionals, teams and agencies involved who do always communicate well. Following a recent family crisis where YP became very suicidal, communication within the network has improved and the network regularly meets together. YP was admitted to the Crisis House and spent two weeks there. The joined-up approach within the network has improved the care and support that the young person is receiving. 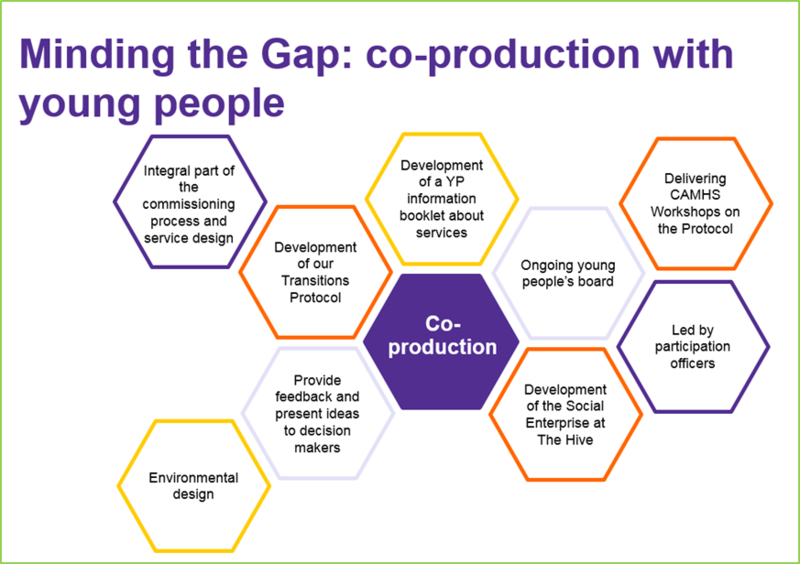 Following YP’s suicidal ideation, the network was unsure of the next steps for YP and The Hive presented YP case at the Minding the Gap Transitions meeting. A referral was made to the Complex Anxiety Depression and Trauma Team and YP has been assigned a care coordinator. YP and The Hive Team Lead are exploring housing options and helping YP become more independent from his family. YP feels more confident to live independently, he has recently requested to have his benefits reassessed and has opened his own bank account. He is taking steps towards more independence. J is a 22-year-old female young person who was signposted to The Hive following an in-patient stay at a Crisis House. J had been accessing their day unit and the referral was made with hope that J would access the practical and 1:1 support offered at The Hive. Her presenting issues were low mood, anxiety and social isolation. Although she was a student in her second year of University, she was given medical leave due to her mental health difficulties and therefore had few opportunities to build a daily routine or socialise. In the past she had experienced high levels of social anxiety and isolation and often would not feel able leave the house. She has a complex family history including having been physically abused and neglected as a child. She has a history of attempting suicide three times since the age of 15 and had entered the Crisis House after experiencing a mental health crisis and feeling like there was nowhere to turn. J had been part of the day unit program at the Crisis House and was very willing to engage in further support. She had hopes of being more active and practical and her worker has suggested creative activities such as baking and art. J started visiting The Hive and has been introduced to a baking group in the morning which she attends regularly with other young people. She also engages well in the arts and crafts sessions. Although she still suffers from periods of low mood, she communicates well with her worker and they are able to work around times when she is unable to leave her house. In discussion with her worker, she will take part in the new iCope life skills group. Although she acknowledges she may struggle in social situations she is willing to challenge herself and is reassured by the support she will receive from The Hive staff team. Now in its third year, the commissioners sought to evaluate the effectiveness of Minding the Gap through an independent evaluation to support the development of a new business plan. Young people reported marked improvements in having strategies to cope with difficult situations in life and in being able to positively cope with difficult situations in life after Minding the Gap. Using the Resilience and Social Engagement Scale (Robinson et al., 2014), The Hive reported 70% of young people showed a significant increase in their resilience and social engagement. The social cost benefit analysis (SCBA) demonstrated a positive return on investment with £3.40 social and economic benefit for every £1 invested. This suggests that young people with the highest level of needs receive the greatest value from involvement in the programme and experienced the greatest improvement in terms of their mental health. Potential savings to the state across health, employment, benefits and criminal justice were recognised through the SCBA as a result of Minding the Gap. Following a successful business case, Minding the Gap has secured funding until 2020. Minding the Gap fits with local i-THRIVE plans in Camden. The THRIVE Framework (Wolpert et al., 2016) encourages shared multi-agency responsibility for promoting Thriving and taking a holistic approach to supporting young people through transitions and considering what is next, both of which are reflected in the fortnightly Minding the Gap multi-agency transition meetings. In addition, this service is aligned with the THRIVE Framework as it considers and draws on the network of services around the young person to maximise engagement and accommodates individual preferences wherever possible, including receiving support from both clinical and non-clinical professionals. The Minding the Gap service supports young people in each of the THRIVE needs based groupings. For example, The Hive is a health and wellbeing service that supports all young people aged 16 to 24 years in Camden. It is a holistic offer that supports more casual service users who can be supported to self-refer to receive more targeted interventions. If a mental health need is identified by another service within The Hive such as the sexual health clinic or substance misuse clinic, the young person can easily engage with additional support such as in the Getting Help THRIVE needs based grouping. If you would like to find out more information about Minding the Gap transitions service please contact Jennie Mackeith at: Jennie.Mackeith@camden.gov.uk.